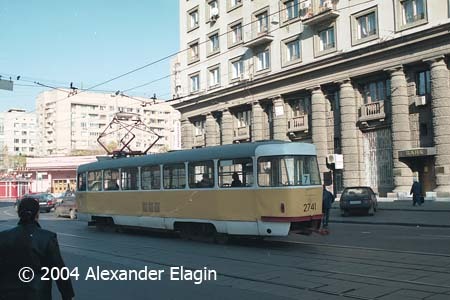 For only four days the tram enthusiasts of Moscow were able to enjoy the long forgotten view of Tatra T-3 tramcars in regular service in the eastern district of Moscow named Lefortovo. Route 7 was diverted to Lefortovo due to track works in Rusakovskaya St. where it regularly operates. 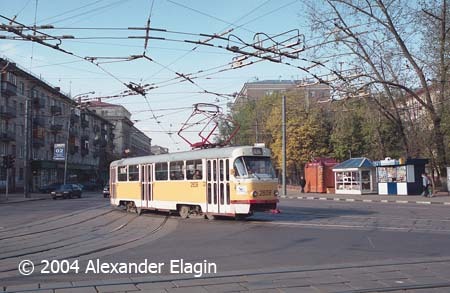 For more than ten years the lines of this district were serviced by Ust-Katav trams (KTM-8/8M); although newer than Tatras, those trams cannot deliver the same riding pleasure - at least, from my point of view. 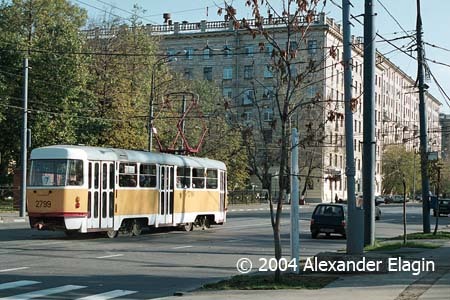 Anyway, it would be impossible for a real tram fan to ignore the opportunity to catch Tatras there where they once dominated, and the weather suddenly helped - the first day, 16th of October 2004, was one of the last sunny days of this autumn. The initial point of our walk is located at a crossing of Nizhnyaya Krasnoselskaya Street with Krasnoprudnaya Street, just across the road from Krasnoselskaya metro station. 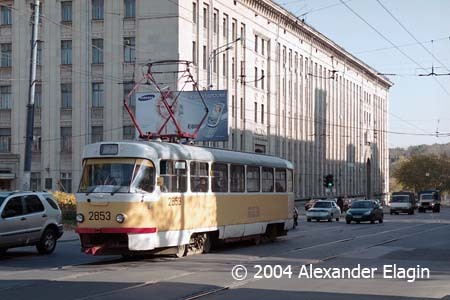 T-3 #2853 is heading towards Baumanskaya Street. Prolomnaya Zastava place. 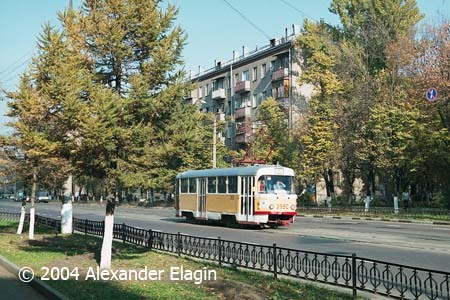 Until mid-1980s, another short line branched here to the left, connecting two major lines in Krasnokazarmennaya St. and Soldatskaya Street. Some traces of that ine can still be found today. 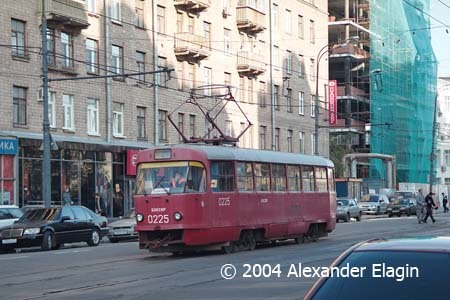 T-3 #2808 turns to the left along with Krasnokazarmennaya Street. The branching tracks of this junction lead to Shosse Entuziastov and Aviamotornaya metro station. The service vehicle #0225 of Bauman depot is not a very rare visitor of this district, it from time to time tows new trams from a railway station or the central workshop to the depot. Aviamotornaya Street is uncommonly empty in this autumn weekend, making it possible to enjoy the view obscured by hordes of motorcars in weekdays.